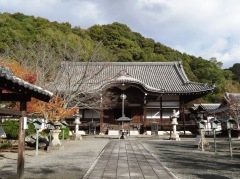 Located on the side of Katsuragi Mountains in the northern part of Iwade City, Negoroji-temple is a historic temple that was established in 1132. The founder of Negoroji-temple, Kogyou-Daishi(Kakuban) was well-known as the restorer of the Shingon sect of Buddhism. At first he established the Main Hall, “Daidenpoin” on the top of Koyasan in 1132 and later he moved to Negoro, the place where now Negoroji-temple is. 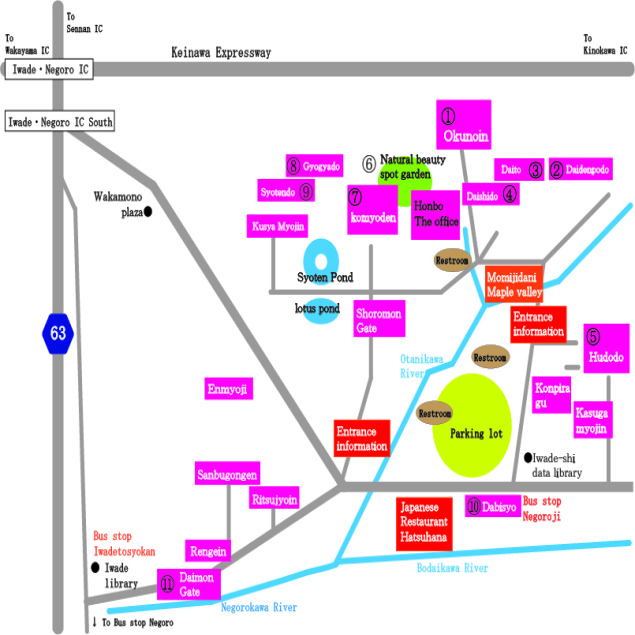 Since then many followers gathered around there and in the late of Muromati Period(1500〜1570) there were about 270 temples and they built the Great Tower,“Daito”(1547), the Main Hall, “Daidenpodo” and other halls in Negoro area. 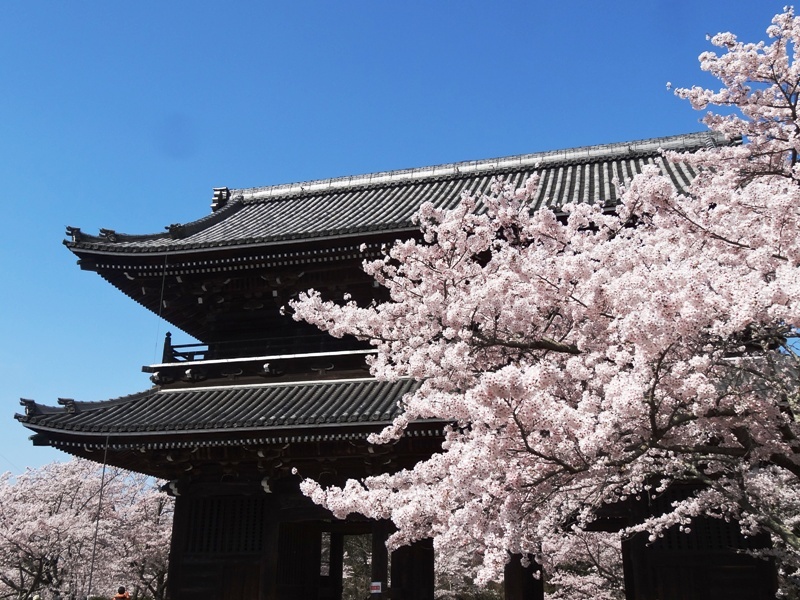 In 1585, however, Hideyoshi Toyotomi who feared the growing power of Negoroji-temple ordered to attack it and every buildings were burnt down except the Great Tower, the Main Hall and the Hall of Kobo-daishi, “Daisido”. Most of the current buildings were rebuilt in the middle of Edo Period(about 1790〜1830). The Great Tower, “Daito” is designated as a national treasure. It is the biggest “Daito” made of wood in Japan and it has neither burnt down nor fell down since 1547. And even it is the only building as a national treasure in Japan that even every day you can enter and look around inside of it. The beauty of Negoroji-temple is enhanced by the cherry blossoms and fresh verdure in spring and colored leaves in autumn. It is well known as a landscape that many visitors pleased. It would be our pleasure if you took the time to visit and deepen your understanding of the Shingon Buddhism, also the Japanese culture and spirit. This tomb is the sacred place where the ashes of Kogyo-Daishi are buried. 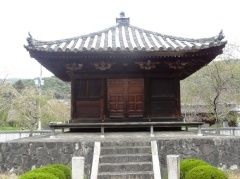 Built in about 1404,this is the main structure of the Negoroji group of temples. 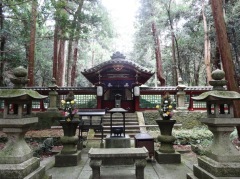 This is where the most important teachings of the Shingon Sect of Buddhism are conducted. 3.5 meters high of "Dainichi-Nyorai", the object of worship, has been enshrined inside with the two other same high statues. The present structure was rebuilt in 1827. 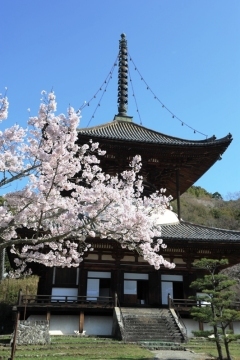 A national treasure, this beautiful two-storied tower symbolizes by its shape, the secret teachings of the Shingon Sect. 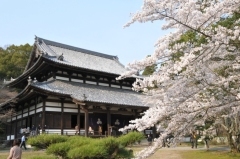 Built in 1547, it is the largest and the oldest wooden Daito in Japan. Standing about 40 meters high, it is the central building on the temple grounds. One of the few structures which escaped from the Great Conquest of Kishu in 1585 by Hideyoshi Toyotomi, its walls still show some scars made by the bullets of the Hideyoshi's army. Enshrining the statue of Kobo-Daishi,the founder of the Shingon Sect,this buiding was built in 1391 and is one of the few structure which escaped from the Great Conquest of Kishu in 1585. It is known as important cultural assets. There is an interesting legend attached to Negoroji's Fudo. When Kogyo-Daishi was attacked by a murderous mob in Koyasan,the wooden statue of Fudo saved his life. When the mob came into the hall looking for Kogyo Daishi, there were two Fudoes. They couldn't find out which the wooden statue is. They dicided to stab the both on the knee with an arrowhead, since blood never comes out from the wooden statue. But blood spurted from the wound of two Fudoes. The mob was very surprised by that and run away. In honor of the Fudo who saved the holy man and was wounded instead of him, many worshippers come to pray for safety from evils and other wishes. The residence of the chief priest of the Shingi-Shingon Sect of Buddhism,the building is comprised of a beautiful palace of Kishu-Tokugawa. 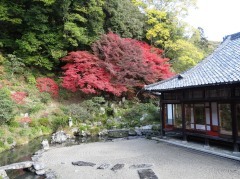 It possesses a garden as a National site of Scenic Beauty. Built in 1804,this is one of the important restorations completed during the Edo period and the image of Kogyo-Daishi is enshrined in it. Religious services are held every morning and evening. 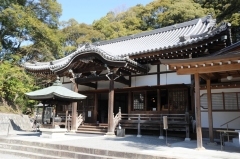 This building has been known as a cultural treasure by Wakayama Prefecture. 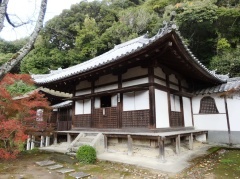 This hall, attached to ShotenDo is the place En-no-gyoja is enshrined. 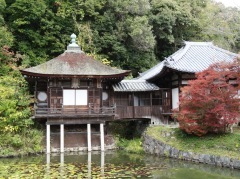 This lovely hall standing above the pond is the place Syoten is enshrined. 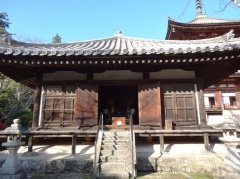 The scarlet paint covering its altar is known as "Negoro Lacquer"
This building marks the site where the remains of Kogyo-Daishi were cremated. Reconstructed in 1852,it is the entrance gate for the entire Negoroji grounds. With the two "Nioh" statues on each side. copyright©2015 negoroji all rights reserved.